Haddock is great family crowd pleaser. 1. Place the potatoes in a pot and cover with cold water. Bring to the boil, then reduce the heat to a simmer. Cook for 10 minutes, until tender, adding the peas for the final minute of cooking. Drain and roughly crush together, adding a good pinch of salt and pepper and half of the butter. 2. Dust the fish in the flour, tapping off any excess, and season with a pinch of salt and pepper. Heat the oil in a non-stick frying pan set over a medium–high heat. Fry the fish for 2 to 3 minutes on each side, until fully cooked, then add the remaining butter and the lemon juice. 3. Divide the fish between four plates and drizzle with the lemon butter pan sauce. 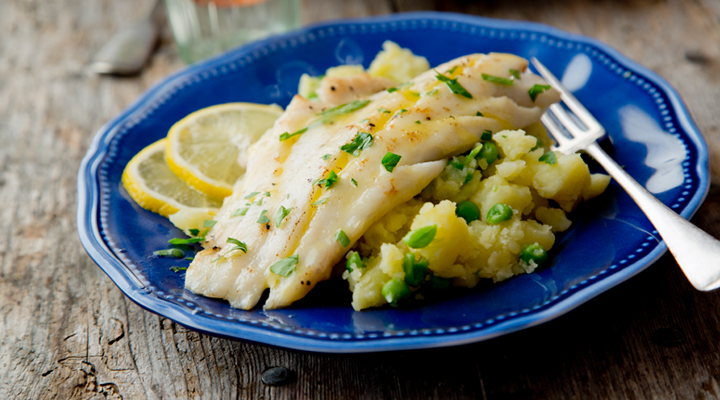 Serve with the crushed potatoes and peas on the side. Tip: Your friendly SuperValu fishmongers will be more than happy to skin and bone the fish for you.